Can you say ‘potamodromous‘ and can you guess what it means? 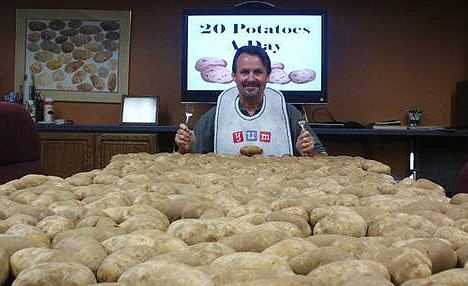 A) Mood disorder from eating too many potatoes. 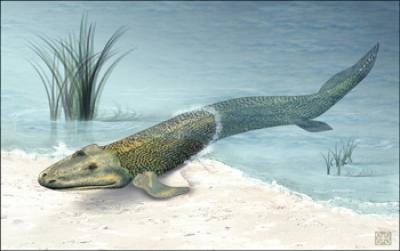 B) An aquatic dinosaur that crawled across land. C) A migration of fish entirely in freshwater. If you pronounced it like ‘poe-tuh-moe-droe-miss’, then you are off to a great start. But what about the meaning? For such a strange word, it simply signifies option C, a migration of fish entirely in freshwater. Many fishes migrate long distances to spawn. In order to better understand these movements, scientists have classified these migrations into several categories. 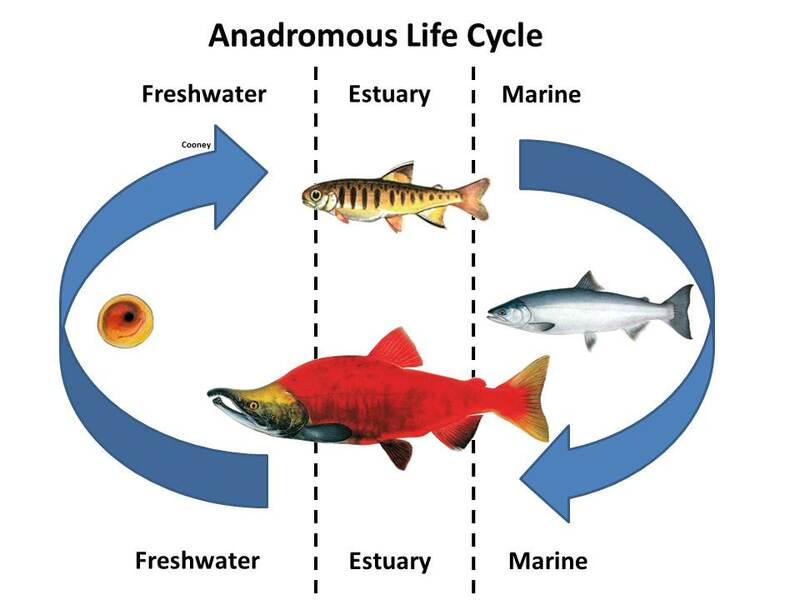 Anadromous fish are born in freshwater, then migrate to the ocean as juveniles where they grow into adults before migrating back into freshwater to spawn. 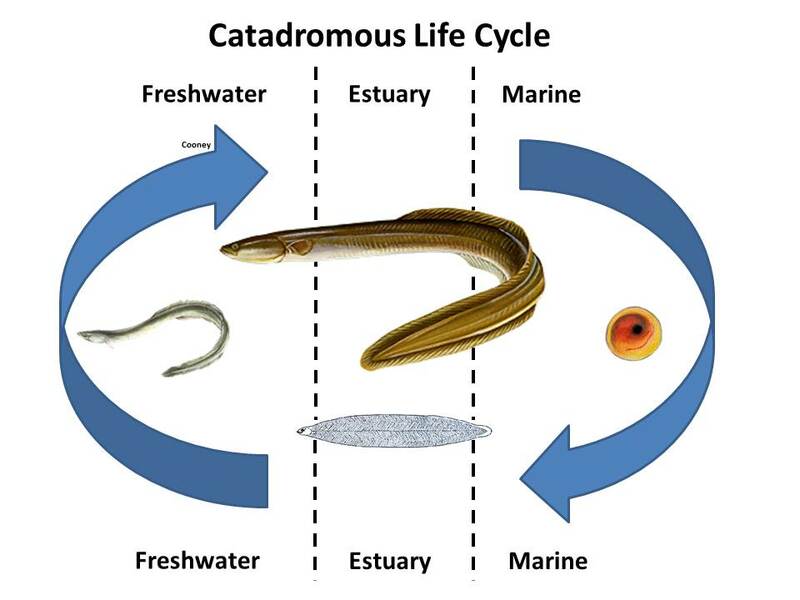 Catadromous fish are born in saltwater, then migrate into freshwater as juveniles where they grow into adults before migrating back into the ocean to spawn. 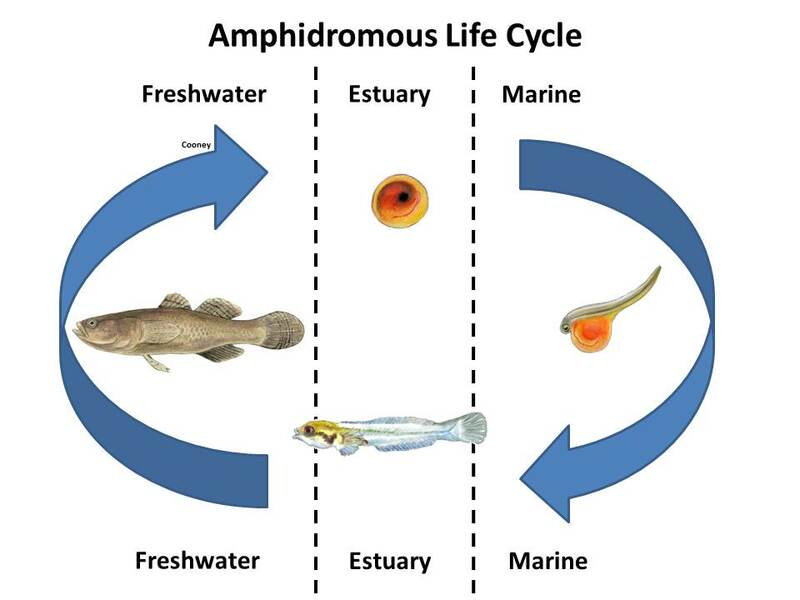 Amphidromous fish are born in freshwater/estuaries, then drift into the ocean as larvae before migrating back into freshwater to grow into adults and spawn. 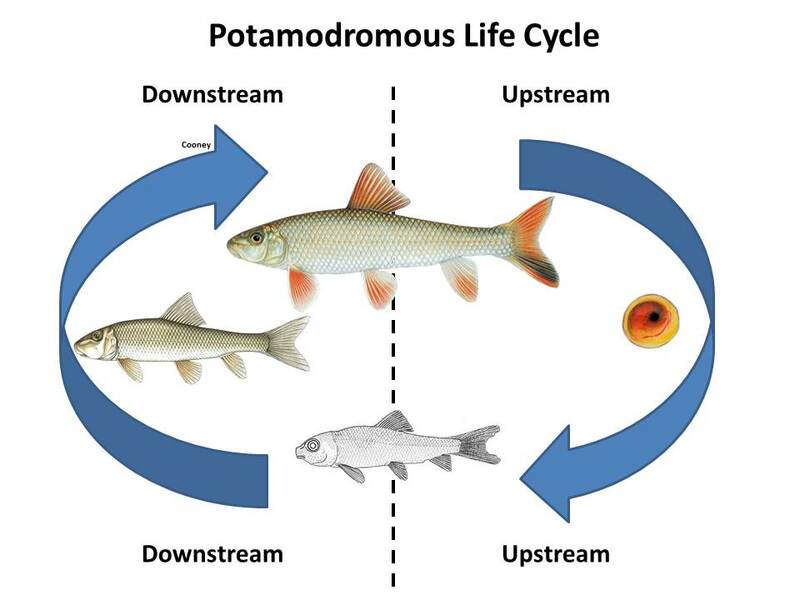 Potamodromous fish are born in upstream freshwater habitats, then migrate downstream (still in freshwater) as juveniles to grow into adults before migrating back upstream to spawn. 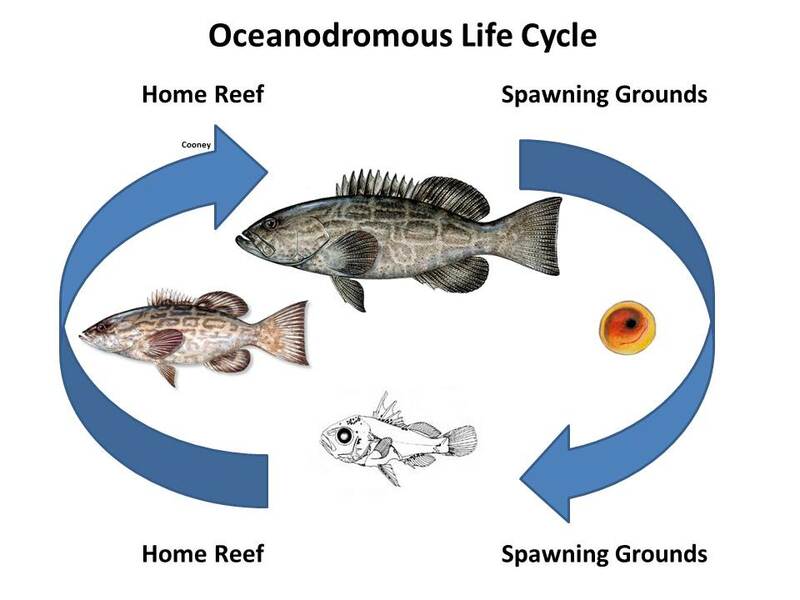 Oceanodromous fish are born near spawning grounds, then drift on ocean currents as larvae before settling as juveniles to grow into adults before migrating back to spawning grounds. Although these different types of migration classifications may be difficult to pronounce, they are important to understand in order to help maintain connectivity between critical habitats. 1) What impacts might you expect dams to have on the ability of fish to get from one location to another? 2) Might impacts to riverine ecosystems propagate impacts on oceanic ecosystems, and vice versa? 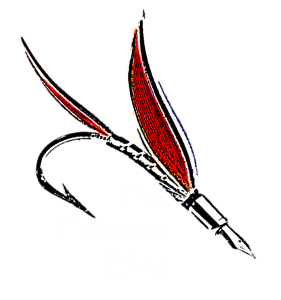 Be sure to check out The Fisheries Blog on Facebook, or check out The Fisheries Blog on Twitter (@FisheriesBlog). Also check out last week’s post about why fish need floods. how to actually obtain useful facts regarding my study and knowledge. make this kind of excellent informative site. Does the term “adfluvial” have the same meaning as is being described for “potadromous” here? Thanks for the given fish migrations but also talk about other terms like limnondromous. 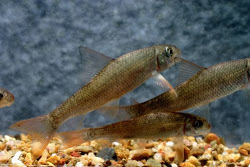 Are there other conditions to base on to categorize fish migrations other than spawning? Is potandromous similar to potamodromous?